One question on the mind of any potential expat thinking about moving to Costa Rica is which part to choose as your new home. My wife, Christine, and I did quasi-extensive research before we made the leap, and came to a few conclusions. If maintaining an existence like the one you have now is important (big box stores with all the products from home, huge hospitals nearby, malls, lots of fine art and other cultural stuff), then the Central Valley area is for you. As well as the capital, San Jose, Grecia, and Atenas are nice little towns, and there you will find like-minded expats in droves. You’ll learn to enjoy the box wine (really) that we all drink at social gatherings, and you are bound to find someone to share your enjoyment of whatever recreation you previously fancied. However, if you are more the sort who, shall we say, once spent a summer following the Grateful Dead, you just may want to look to the Southern Zone. Down here, there is much more of a Wild West feeling, and people pretty much act, speak, and dress however they like. Christine and I have always had a taste for adventure. In our very first foray to the Southern Zone, we realized that it was calling us. I’ve reclaimed my past life as a musician and she hones her chef skills with local ingredients, many of which she grows in the incredibly fertile soil. 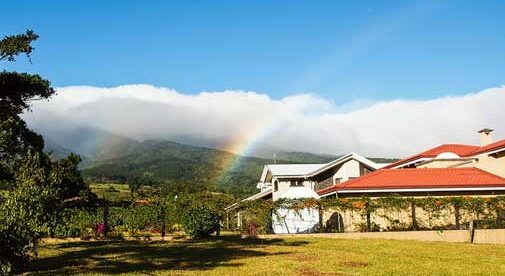 The agricultural center of Costa Rica, the Southern Zone is anchored by San Isidro, a medium-sized city with all the necessities, including a huge regional farmer’s market open on Thursdays and Fridays. Aside from amazing bargains (four freshly picked pineapples for $2), the pageantry of buyers and sellers makes for a true cultural experience every week. Not to mention, Illena, the Queen of the Gringo Corner in the back, who keeps track of expat news for everyone and sells healthy products. From San Isidro, it’s a 30-minute drive down the mountain to the beach town of Dominical. Dominical is a dusty little surfer village that’s just beginning to be discovered. Grand restaurants share a main street with humble little sodas (Costa Rican “mom and pop” restaurants) and surf shops. The Ticos (local Costa Ricans) there respond with broad smiles to a wave and a “Buenos” as tattooed millennials vie for parking spaces with wizened baby boomers in shorts and rock ‘n’ roll t-shirts. I play guitar at the local watering holes, sharing the stages with local musicians. (I am always touched and surprised by how nicely the under-40 crowd responds to my repertoire of ‘60s and ‘70s music.) There, I invariably find myself in conversations with visitors who are toying with the big move. They seem visibly relieved to learn that the expat community here shares whatever we can as we all figure out how to make our lives better. Remember, we Costa Rican expats all have one thing in common: we were crazy enough to leave a perfectly good country and move somewhere we couldn’t even speak the language. That kind of experience brings people together quickly.